NETWORK FINALS: SCHOOLED gained 0.1 in final numbers, while the NCIS and CHICAGO MED reruns lost the same. 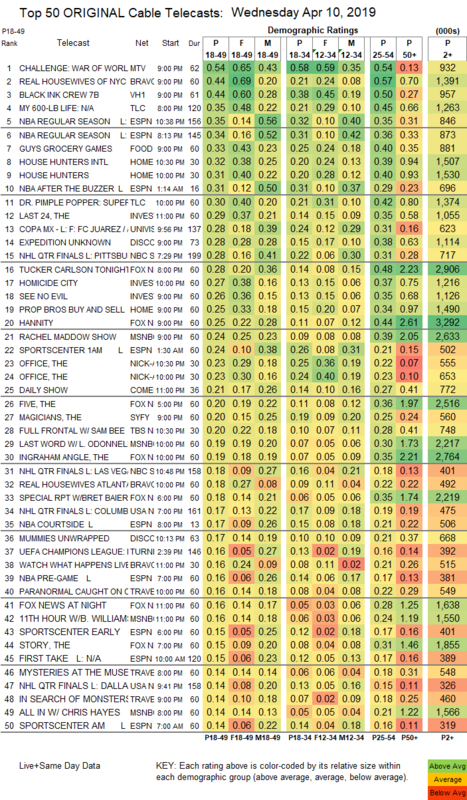 CABLE HIGHLIGHTS: MTV’s THE CHALLENGE led Wednesday cable, up 0.03 to 0.54. Bravo’s REAL HOUSEWIVES OF NYC edged up 0.02 to 0.44. VH1’s BLACK INK CREW dipped 0.05 to 0.44. On TLC, MY 600-LB LIFE rose 0.09 to 0.35, and DR PIMPLE POPPER was up 0.07 to 0.30. ESPN’s NBA doubleheader on the last night of the regular season was at 0.35/0.34. Food Network’s GUY’S GROCERY GAMES climbed 0.08 to 0.33. On HGTV, HOUSE HUNTERES INTL shed 0.02 to 0.32, HOUSE HUNTERS was similarly down 0.02 to 0.31, and PROPERTY BROTHERS dropped 0.04 to 0.25. On ID, THE LAST 24 was at 0.29, HOMICIDE CITY was at 0.27, and SEE NO EVIL ticked down to 0.26. Univision’s COPA match was at 0.28. Discovery’s EXPEDITION UNKNOWN was at 0.28, with lead-out MUMMIES UNWRAPPED at 0.17. NBC Sports Net and USA aired NHL PLAYOFFS games, respectively at 0.28/0.18 & 0.17/0.14. Fox News’s TUCKER CARLSON TONIGHT led cable news at 0.28/0.48/2.9M, with MSNBC’s RACHEL MADDOW SHOW at 0.24/0.39/2.6M, and CNN. On Syfy, THE MAGICIANS rose 0.04 to 0.20, and HAPPY ticked up to 0.10. TBS’s FULL FRONTAL crashed by 0.14 to 0.20. 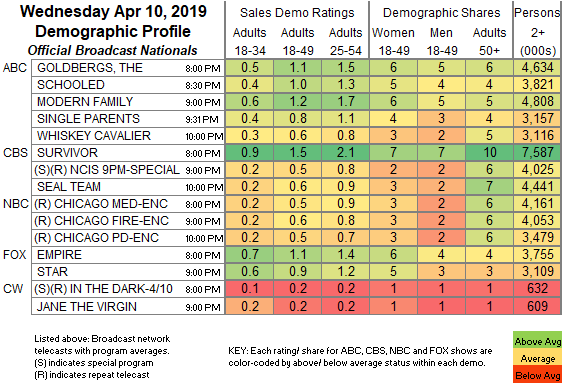 Freeform’s THE PERFECTIONISTS was steady at 0.14. FX’s WHAT WE DO IN THE SHADOWS collapsed from last week’s increase, down 0.16 to 0.11. On A&E, ZOMBIE HOUSE FLIPPING was at 0.08. The season finale of POP’s SCHITT’S CREEK ticked down to 0.07. IFC’s BROCKMIRE dropped 0.03 to 0.06. WGNAmerica’s GONE grew by 0.03 to 0.06. Do you have ratings for ’30 Minute Meals’ (FOOD, 12:00P), please? Thank you. Viceland in the Top-150 for the first time! Look out, CNN.